After the awful Alien Vs Predator movies, this one promises to be a good Predator movie and a return to the style of the original. 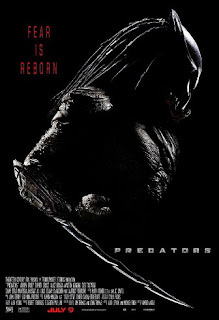 Predators is directed by Nimrod Antal and produced by Robert Rodriguez, based on a script written by Rodriguez in 1994. It is starring Adrien Brody, Topher Grace, Alice Braga, Laurence Fishburne, Danny Trejo and Derek Mears. You can also watch a sneak peak at the official site of the movie. Will Predators be for Predator what Aliens was for Alien?? ?